Movie: "A Star is Born"
An aspiring actress is catapulted into to stardom when she meets a leading man who takes a fancy to her. As her star rises, his starts to fade as his heavy drinking begins impacting his career. 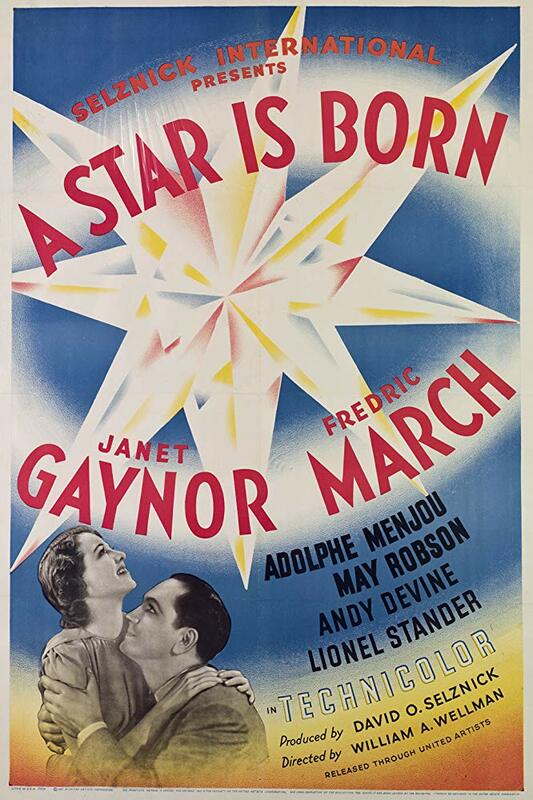 There are now four versions of "A Star is Born," but this version, the 1937 version, is the one that started it all. This movie is officially directed by William A. Wellman, though Jack Conway was an uncredited director on the film. 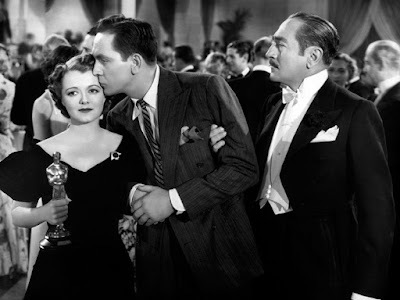 It tells the story of a young woman named Esther Blodgett (Janet Gaynor), who moves from the midwest to Hollywood with dreams of becoming an actress. She spends months in Los Angeles without a single part to show for it. 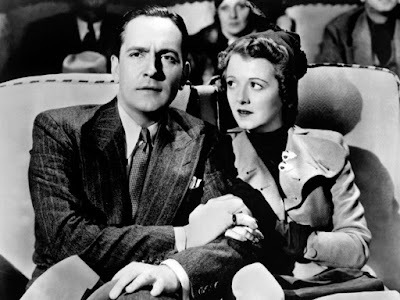 It is when she takes a job as a server for a caterer at an exclusive Hollywood function that she catches the eye of well-known actor Norman Maine (Fredric March). Norman thinks Esther is cute and has an endearing quality about her. They begin a relationship, and he uses his influence to get her a screen test at the studio where he is employed. He also pushes to get her a leading role opposite himself. 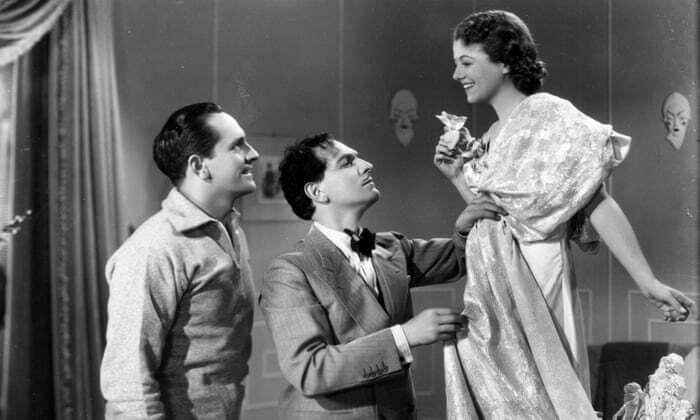 Test audiences really take a liking to Esther, which immediately catapults her career. Norman, however, has been battling alcoholism for quite some time, and his drinking is starting to affect his work. As Esther, now known as Vicki Lester, begins her trip up the ladder of Hollywood stardom, Norman begins a rapid spiral downward, which puts a strain on their lives together as husband and wife. It just goes to show that Hollywood has been making movies about Hollywood as long as the industry has existed. Heck, there's even a scene in this movie that takes place at the Academy Awards, which wasn't even a decade old at that point. With so much adulation going on, do you really expect a movie like this to *not* get nominated for several Oscars? This movie is less about a rising star and more about the exploitative nature of the film business. It explores how the industry uses people and disposes of them without care. It shows that once you're in the limelight, the industry will protect you and treat you like their best friend, but the second your star fades and you becoming unprofitable or out of fashion, the support is gone and people's true colors are shown. It also proves that being a prominent favorite in Hollywood is almost always more about who you know than how talented you are. Those friendships, that nepotism, and a set of good looks will take you further than sheer capability, expertise, or prowess. This version of "A Star is Born" gives audiences a proper look into how misogynistic 'old Hollywood' really was and gives a glimpse into how far actresses would have to go to get a shot at seeing their names in lights on a marquee. What mattered most back then was whether or not a woman's name, appearance, or fictionalized backstory caught the audience's eye. Who cares if she can perform, what's her name and is it catchy enough!?! "A Star is Born" is really the tale of two movies. The first is all about Esther and her character arc during her journey to the top, and the second is about Norman and his fall from grace and his degradation into self-pity and despair. Esther's story isn't uninteresting, but we found the second half of the film to be much more compelling, especially once Norman's problems rear their ugly head where Esther's career is concerned. This half contains the meat and potatoes of the story, showcasing the ugliest side of the film industry with brutal pointedness. This part is much more engaging than the 'woman with a dream of making it big' scenario, which was pretty typical even for 1937. Despite being over 80 years old with some very dated aspects, there are still elements of this story that ring true and transcend the era, plot points we find very poignant even to this day.